One of the biggest fallacies presented in the media today is the catastrophic impact of a Grexit on the global economy. The media emphasizes the catastrophic impact that a Grexit will have on the European Union. The contagion theorists over-sell the Greek economy and its effects on the European Union and the global economy. Global markets are over-reacting to the ill structured narrative that a Grexit will lead to a doom and gloom effect on Europe and the global economy. On July 5th, the world truly understood the mistakes undertaken by the European Union. In an effort to sell the greater Europe strategy; Europe coddled countries that did not have the financial strength and monetary responsibility to be part of the European Union. Greece, Spain and Italy were notorious for not maintaining their houses in order. Italy went through two major devaluations of its currency which lead to the “economic miracle” of the 1990’s by making Italian products cheaper in the global market. Thus countries such as Greece should never have been allowed to join the European Union, because they never met the requirements set forth by the European Union. In the 1990’s the European Union and Greece worked with Goldman Sachs to move Greek debt’s off-balance-sheet; allowing Greece to virtually meet the European Union requirements. Greece has historically lacked financially prudentcy and its domestic market has required financial and organizational restructuring over the past two decades. Cheap money masked Greece’s structural problems, allowing it to undertake more debt at a lower cost basis than its actual risk premium suggested. From the 1990’s onward, the credit markets lead by French and German banks opened the flood gates of debt. Greek debt was purely government debt. The government used debt as a means to buy elections via socialist programs and to build needless infrastructure such as stadiums for the 2004 Olympics. Stadiums that after the Olympics have stood vacant and become decrepit. This debt binge drove Greece’s per capita income from $11,960 to $31,701 from 2000 to 2008. The Greek Government’s Debt to GDP ratio was below 100% in 1999, and steadily rose to 174% in 2013. It seemed that debt was the panacea for all Greek ills, until the global markets collapsed in 2008. The debt spigot was turned off, and Greece faced a liquidity crisis. The European Central Bank was forced to act, and it slowly stepped in to provide the liquidity it required. Greece with a population of eleven million has nearly 800,000 public employees, some of whom receive two paychecks from different government agencies. Collection of taxes and general tax fraud is rampant within the system. People pay taxes because they believe in the fairness of the system. As soon as the fair play rule of tax payments is questioned, it becomes a luxury expense rather than a necessity within the system. For most Greeks, taxes have become a luxury. Tax evasion is the norm within the general Greek model. However, for all the doom and gloom you hear from the business media, the Greek economy is only as large as Metropolitan Miami, Florida. Greece is ranked the 46th largest economy based on Nominal GDP. Countries such as Pakistan, Philippines, and Chile are ranked higher than that of Greece (IMF). A Grexit will have a minimal impact on the EU or Global Economy. Greece’s official unemployment rate has held steady at 26% with youth unemployment being above 53%. Greece as an economy is not that important to Europe, but what a Grexit symbolizes to Europe is very important. A Grexit symbolizes the failure of Europe to meet its vision of a common and equal currency. The notion that a common currency would raise all boats has now come under question. The European Union is less of a Union today, because it never set up a mechanism to help its weakest link. European central planners focused purely on fiscal austerity with minimal planning in achieving GDP growth. Pilling on more debt was the modus operandi of the day. Change in Greek Debt between 2009 and 2014. A move from Bank debt to State based debt. 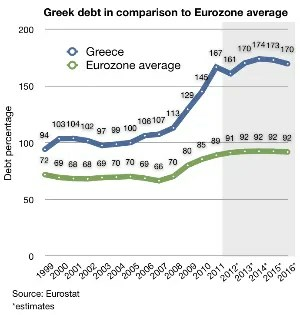 Greece’s debt has been socialized by European Member states. 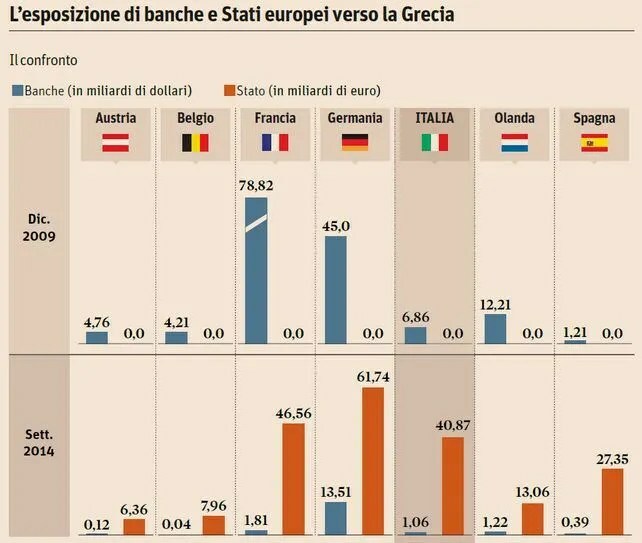 Most of the Greek debt was owned by private banks, though in the past 5 years most of the private debt has moved to the balance sheet of EU member countries. European Union taxpayers are now on the hook for most of the Greek debt. Chancellor Merkel and President Hollande will have to explain to its citizenry why the German and French taxpayers where saddled by private bank debt. Why was the private debt socialized, and how are the banks monitored today to prevent this again in the future? French and German banks knew the risk premium associated with the Greek debt and they willingly lent the money. French and German banks knew that the EU Central Bank would be its backstop and do whatever was necessary to save the banks, eliminating any moral hazard. The European Central Bank has bailed out Greece’s creditors at the expense of the EU citizens. A Grexit is a necessity to allow Greece to restructure and become a viable economy. Greece needs a cheaper currency to achieve its own “miracle economy.” Greece needs to devalue its currency, print more money and become globally competitive by achieving growth. Greece cannot be competitive within the Euro, it needs its own currency and devaluation strategy that is different than that of Europe. It needs the ability to re-negotiate payments with the IMF and work on a major internal restructuring model. A Grexit will allow it to open up its internal economy to Foreign Direct Investment and develop projects that make it competitive. Greece needs to readjust and become globally competitive and it can only achieve this via a Grexit. Greece cannot survive within the confounds of the European Union at this juncture in time. The more they stay within the EU the longer it will take to achieve growth. An organized Grexit with the financial backing of the EU, will bring further stability to Europe and will incline Greece to come back when it truly meets the EU debt criterium. Organized restructuring will bring credibility to Europe and allow failing states to survive and thrive within the auspices of the EU. Cost pressures on any new debt will force Greece into compliance and readjustment. A Grexit will force moral hazard back on the table thus reaching natural risk equilibrium. A Grexit is a good thing, and the sooner it happens the better it is for Greece and Europe. The ECB model works in the best of times, yet with Greece it has proven to be a systematic failure in the worst of times. The European Union must re-adjust and realize that if it wants Eastern Soviet bloc countries to formally join the common currency, it must have internal and capable system to save them in worst of times. If the EU believes in it’s Union then it better start thinking of all its citizens as equal participants in the European dream, rather than dicing the market into “us” versus “them.” The European Union must develop a restructuring equilibrium that balances social needs and austerity measures. For the EU to be viable, it must treat all members equally, otherwise it will resemble the emperorships of the 1800’s. Investing in Greece can now be a very viable option for global businesses. Greece is on sale and has a large and educated labor force. For corporations who enter Greece and set up operations, the restructuring of the market can bring great gains. Especially if the investment is designed to service the EU economy. Companies can capitalize on the discounts brought forth by the economic crisis and can pay more competitive salaries than those in other parts of Europe. In the case of a Grexit, the price variable and the devaluation of the currency will make Greek products even more competitive in European markets. Greece is a major distribution point to China and other maritime markets, thus any company working towards a stronger logistics system within the EU can take major advantages of the current economic crisis. Contact us to develop your business opportunities in Greece and all Global Markets!